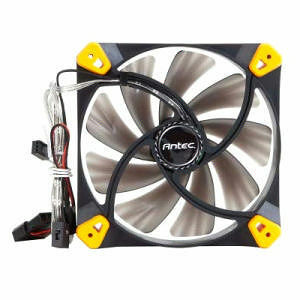 Antec's TrueQuiet fans bring proven cooling and Quiet Computing to your system. Constructed for versatility, TrueQuiet fans include a convenient 2-speed switch that allows you to easily choose either silent or maximum RPM cooling. Because a functional computer relies on more than just cooling, TrueQuiet is equipped with silicone grommets and a uniquely-designed fan blade to reduce turbulence, vibration and noise for overall quiet operation. TrueQuiet comes in two models, 120 mm and 140 mm fan, and is backed by a 2-year limited warranty on parts and labor. Upgrade your fans and add optimal cooling and functionality to your PC with TrueQuiet.